Product code: NS347 Categories: Modern & Retro Jewellery, Pearls. 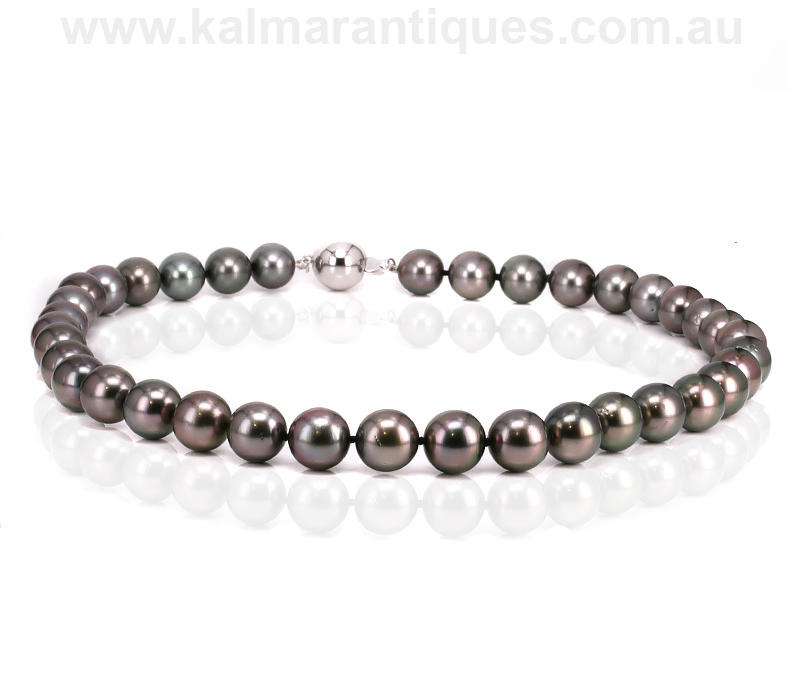 Here is a very elegant Tahitian black pearl necklace that will sit perfectly around any the neck of any woman and always be admired for its beauty and elegance. These Tahitian black pearls are of such a high quality and graduate from 10mm to 12mm and are all beautifully round and matched for their colour and lustre. In total there are thirty nine natural black Tahitian pearls and the strand measures 47cm and is fitted with an 18ct white gold clasp. These lovely black pearls will look lovely during the day and continue to do so well into the night. Tag: Tahitian black pearl necklace. The Tahitian pearl comes from Pinctada margaritifera of the Cumingii variety. This pearl oyster secretes black pigments naturally giving the characteristic tint to its mother-or-pearl and its pearls. Living in the lagoons of the Polynesian atolls, Pinctada margaritifera measures from 25 to 35cm in diameter. In its natural state, it lives attached to coral and feeds on plankton, tiny creatures and plants floating in the lagoon. Many observers have spoken of the Polynesians being familiar with it long before the Europeans arrived. They used to make abundant use of mother-of-pearl to make hooks and ornaments, as well as “natural” pearls.